In his first film since Oscar-winning film Ex_Machina, writer/director Alex Garland delivers another mind-blowing science-fiction experience. For much of the film, Annihilation feels as tense and unsettling as anything I have watched in a long, long time. A dazzling visual experience, with five exceptional female soldiers, Annihilation's cerebral writing and ambiguity in the final act will leave lots and lots of people discussing it long after it is over. Not for the squeamish. Annihilation does not hold back in delivering scenes of violence and terror. What Annihilation builds to in its last 15-20 minutes or so is something that will prove very divisive to the audience. The film does not wrap up things in a simple or obvious way. This is not the film you are being shown in trailers and TV spots. Annihilation has a deliberate cadence and pace that does not lend itself to anything but a patient, tense, dramatic film and not a science-fiction/action-type movie you might be expecting. In Alex Garland's sophomore feature, Annihilation, the writer and director of 2015 Oscar winner Ex Machina, goes big, bold, and ambitious. Novelist Jeff VanderMeer has mentioned that his source material, a novel of the same name, might fall in the "unfilmable" category. Admittedly, not having read the book, I am told from those who have, Garland essentially left the cover and dust jacket in tact, and reworked all the stuff in between. 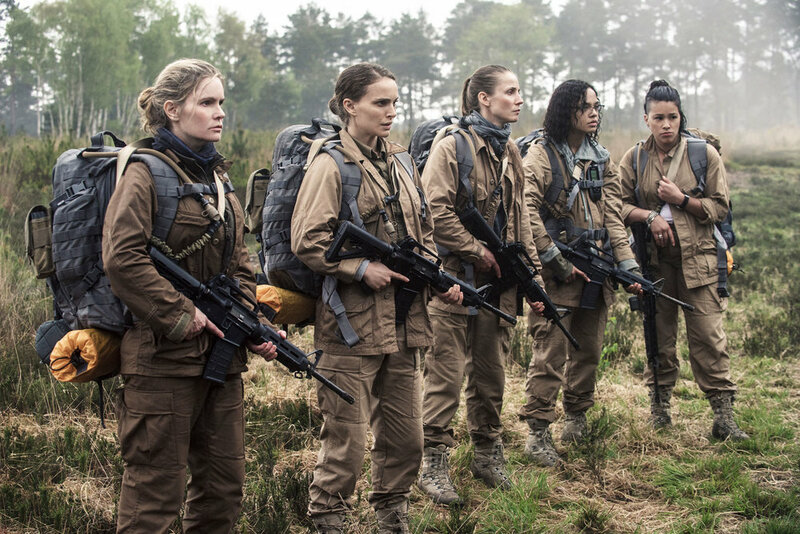 Annihilation also arrives in theaters following a significant disagreement behind-the-scenes, between a producer and Garland, which erupted in a debate over how the movie should actually end. As a result, Annihilation will be available internationally on Netflix, but still earn a conventional release in North America. Fears that the movie would be "too intellectual" and "too complicated" (i.e. mainstream audiences won't get it) were argued away by studio brass who believed in what Alex Garland created; therefore, Garland's vision is the film we have before us. Former soldier, now college Biology professor, Lena (Natalie Portman), remains heartbroken, reeling from the loss of her military husband Kane (Oscar Isaac), classified as K.I.A. nearly a year ago. Declining to attend a dinner party for reasons which become painfully clear later on, Lena opts to spend a Friday night home alone, painting a bedroom. And then suddenly, out of nowhere, in walks Kane - disoriented, emotionally absent, and perplexed by Lena's immediate shock, tears, and her suffocating embracing and overwhelming of him. Instantly recognizing something is wrong, Kane cannot answer any of Lena's questions, and only a handful of minutes go by before Kane begins feeling terrible and is rushed to the hospital. The hospital is actually an undisclosed government facility known as Area X, and Kane is essentially placed on life support. Lena awakens to realize that she has been brought there as well. She meets the calmly clinical Dr. Ventress (Jennifer Jason Leigh), who quizzically asks her some questions. Eventually, Lena is asked to join up with three other women (and Dr. Ventress) for an expedition into "The Shimmer," a bizarre, rainbow-colored formation that has slowly engulfed a significant chunk of land. As it grows, it becomes more and more of a threat to take over residential land and space. Those sent into "The Shimmer" have failed to return, with one exception - Kane. But with Kane now on life support, Dr. Ventress has determined that she will lead the next expedition, with the goal of reaching a lighthouse. Located within "The Shimmer", in the opening scene, something from outside of Earth crashed into the base of this very same lighthouse. Although the arranging of the team is a little nebulous and illogical as depicted on screen, we have a dynamic quintet of researchers and explorers assembled, each offering something unique and distinctive from one another. Lena brings a military and science background, Josie (Tessa Thompson) is a physicist, anthropologist Cass (Tuva Novotny) joins former police officer Anya (Gina Rodriguez), along with Dr. Ventress completing the team. Garland is such a gifted filmmaker that his set up is irresistible. Of course we all want to see what's in "The Shimmer," and once Lena awakens at Area X and recognizes why she is there, and the pitch is made to her, we start seeing the ominous backdrop of "The Shimmer" blanketing the sky, occupying the background, almost enticing and goading us to enter. There is a lot revealed within "The Shimmer" and, in turn, Annihilation as a whole; the title clearly meaning something far different that what people will perceive it to be. The deeper the team advances, in an effort to reach that lighthouse, they encounter things about themselves and creatures they don't understand. The power within "The Shimmer" is immense, slow-creeping, and not for the squeamish, as there are things you see and experience in Annihilation you will not soon erase from your memories. Few recent films have truly been this intense, mysterious, and confounding on some level. Garland excels at creating that arm-scratching, seat-shifting, white knuckle-style mood and atmosphere. Within "The Shimmer," he drapes uncertainty around the periphery of every frame. As we attempt to orient ourselves to what we are seeing on screen, he provides ample opportunity to explore cautiously, nervously, anxiously, and right along with the team. Ultimately, Annihilation whittles itself down to a final act that will polarize a lot of people. Along the way, there are a few moments of graphic violence and imagery hard to let go of. But there is also a lingering beauty about Annihilation's visual presentation, style, and story that is equally hard to abandon. And it may very well be that I appreciate those two elements of the film the most of all. Starring: Natalie Portman, Oscar Isaac, Jennifer Jason Leigh, Gina Rodriguez, Tessa Thompson, Tuva Novotny, Benedict Wong, David Gyasi, Sonoya Mizuno.